Project Organizers have the ability to manage the project directory (otherwise known as the “People” page in the menu). This includes the ability to update the profile information for any users that have not yet registered for Fieldlens as well as removing users and companies from the project. If someone without a Fieldlens account has been added to your project, their email address will show up on the project People page with a Not registered indicator next to it. 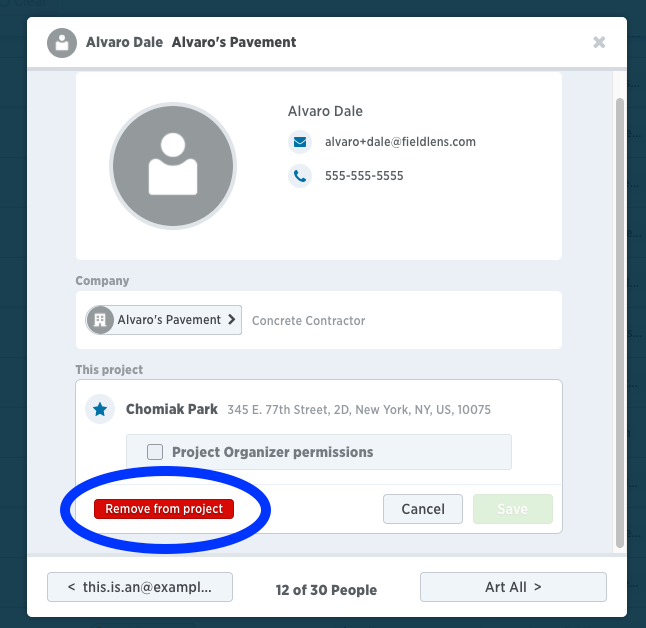 Project Organizers can add in these details for any unregistered profiles. Other users (non-Project Organizers) can add in these details for any users they themselves invited. Adding these details in will make their contact information available for everyone on the project. Once the person creates their Fieldlens account they will be able to update and manage their own profile. From the People page, use the drop-down menu to filter for profiles with missing information and click the line showing the email address to edit the details. Click Edit from the top right. If you’ve added an unregistered user to your project, you will sometimes notice that they are already associated with a company within Fieldlens. This will happen if there are other users from the same company registered within Fieldlens. However if the unregistered user is not associated with a company, you can create a new company and add them to it. You’ll see an Add to a company button next to their email address or within their user profile - click either to get started. You can then add details to the company profile like phone number, email and address. Click on the company name and then Company Profile. Click Edit in the upper right to fill in the appropriate details. Select Save in the bottom right. Only a Project Organizer can remove people from a project. If you’re the Project Organizer, click into the People page to get started.